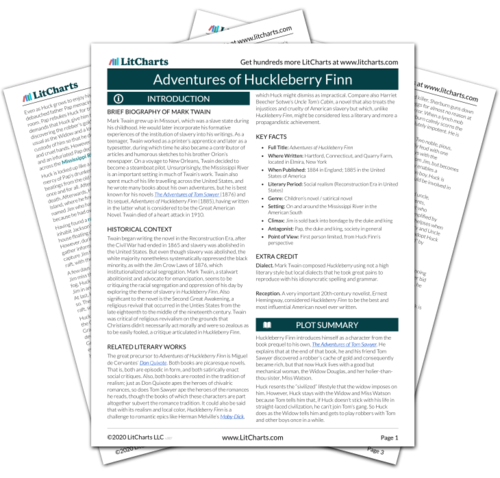 Instant downloads of all 945 LitChart PDFs (including The Adventures of Huckleberry Finn). Huck wonders who shot the dead man he and Jim discovered, and why, but Jim doesn’t tell him because “it would fetch bad luck.” The pair finds money stashed in a coat, which leads Jim to speculate that the people in the house stole the coat; otherwise they would have known money was in it and wouldn’t have left it. Huck wants to discuss the dead man more, but Jim refuses. Jim withholds the identity of the dead man from Huck not because he superstitiously thinks that doing otherwise “would fetch bad luck,” but to protect Huck. In doing so, Jim shows himself to be a caring, loving, gentle, and emotionally intelligent human being—traits that slavery never grants to slaves. In response, Huck reminds Jim of how, a few days earlier, Huck had fetched a snakeskin with his bare hands, which Jim thought would bring the very worst luck. However, Huck says, all it’s brought are the eight dollars, and, on account of that, Huck wishes he had such bad luck every day. Jim warns that the bad luck is coming. And it does. That Friday, Huck finds a rattlesnake in the cavern he and Jim are hiding in and kills it, curling it up on Jim’s bed as a prank. When Jim throws himself into bed that night, however, the dead snake’s mate is there and bites Jim’s ankle. Huck kills the second snake as Jim gulps down some of Pap’s whisky, yelling in pain, his foot swelling up all the while. Jim is incapacitated for four days and nights, by the end of which Huck resolves never to touch a snakeskin again for fear of bad luck, nor do other things that bring bad luck, like look over his left shoulder at the moon. While Jim sometimes invokes his superstitious-ness to protect other people, like Huck, Huck sometimes invokes his superstitious-ness to relieve himself of responsibility for his actions. After all, he plays a mean prank on Jim by putting the snake in Jim’s bed, but, instead of holding himself responsible, he blames the bad luck he generated by touching the snakeskin. Also note how Jim, held by slavery to be sub-human, always treats Huck kindly, while Huck, held by slavery to be superior to Jim because of his whiteness, plays mean pranks. The novel continues to eat away at the idea that slavery’s categorization of blacks is in any way accurate. The next morning, bored, Huck wants to go exploring, which Jim thinks is a good idea, but he reminds Huck that he mustn’t get caught. Huck decides to dress up as a woman using clothes found in the drifting cabin, an idea that Jim praises. Huck practices acting like a girl all day, and paddles in his canoe up the Illinois shore just after dark. He lands at a town, and, after walking around, peeps in at a window to see a woman, later identified as Mrs. Judith Loftus, knitting. She is a stranger, so Huck decides to ask her about what he wants to know. He knocks and reminds himself not to forget that he is pretending to be a girl. Just as Huck likes to mix up all the foods on his plate, crossing boundaries others wouldn’t cross because of arbitrary rules, so too is he willing to cross the boundary of gender by dressing up and acting like a girl. It is by acting with such freedom that Huck preserves his freedom. However, this scene foreshadows later scenes in the novel in which dressing-up is not an expression of freedom, but rather a means of conning people and satisfying one’s desire for money. Wilson, Joshua. "The Adventures of Huckleberry Finn Chapter 10." LitCharts. LitCharts LLC, 19 Sep 2013. Web. 9 Apr 2019. Wilson, Joshua. "The Adventures of Huckleberry Finn Chapter 10." LitCharts LLC, September 19, 2013. Retrieved April 9, 2019. https://www.litcharts.com/lit/the-adventures-of-huckleberry-finn/chapter-10.